Gund is proud to present Pusheen — a chubby gray tabby cat that loves cuddles, snacks, and dress-up. As a popular web comic, Pusheen brings brightness and chuckles to millions of followers in her rapidly growing online fan base. 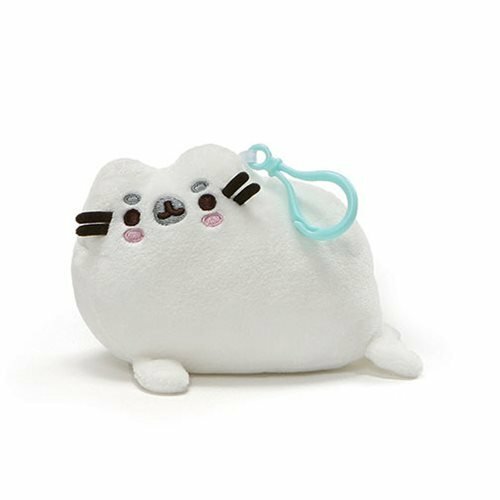 Part of the Gund Pusheenimals plush collection, this adorable Pusheen The Cat Pusheen Seal 5-Inch Backpack Clip Key Chain features the happy cat as a sweet white seal with eyebrows, blushing cheeks, and cute little flipper tail. Includes sturdy plastic clip for secure hanging. Surface-washable for easy cleaning. Measures about 5-inches long x 3-inches wide x 3-inches tall. Ages 1 and up.